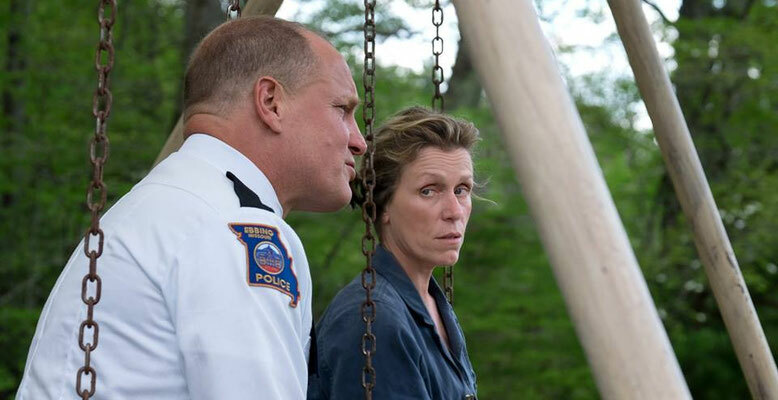 After months have passed without a culprit in her daughter’s murder case, Mildred Hayes (Frances McDormand) makes a bold move, painting three signs leading into her town with a controversial message directed at William Willoughby (Woody Harrelson), the town's revered chief of police. When his second-in-command Officer Dixon (Sam Rockwell), an immature mother’s boy with a penchant for violence, gets involved, the battle between Mildred and Ebbing's law enforcement is only exacerbated. Frances McDormand is a rage-fuelled force of nature as Mildred Hayes in Martin McDonagh’s Three Billboards outside Ebbing, Missouri. She strides into town like a foul mouthed gunslinger (aided by Carter Burwell’s powerful, Western-inspired score) hellbent on vengeance for the unsolved murder of her daughter Angela. In a role that could (and really should) net McDormand her second Best Actress Oscar, Mildred is fierce, unpredictable and uncompromising. At the same time, we sense her motherly compassion - a vulnerability that lies beneath her tough exterior. Mildred’s aim is to force the Ebbing Police Department to focus on finding her daughter’s killer. This is the only way that she can deal with her grief and her first step is to hire the titular billboards - complete with their bold and incendiary message. Unsurprisingly, Mildred’s actions send shock waves throughout her small town community. They also shine a long overdue and disturbing light on the effectiveness (or lack thereof) of Chief Willoughby (a wonderfully charismatic performance from Woody Harrelson) and his fellow police officers. This spotlight falls most uncomfortably on Officer Dixon. In a film that examines the complicated and compromised inner lives of all of its characters, Sam Rockwell is superb in this role - conveying all sides of Officer Dixon. At best, he is a fool, a grotesque mummy's boy and a drunk. At worst, he is a dangerously violent racist who believes he is above the law. Like in his previous two feature films (the superb In Bruges and Seven Psychopaths), McDonagh layers Three Billboards with tension, black comedy and startling violence. However, the result in this case is a sometimes uneven cinematic experience. Three Billboards is often laugh out loud funny - its whip smart black humour giving us a welcome release from the tension. However, at other moments the comedy feels out of place and jarring. Meanwhile, the film also suffers from some pacing issues and features scenes that left me questioning the timing of certain events. Others moments (particularly in the film's third act) felt a little too contrived. Despite this, the powerful performances from McDormand, Harrelson and Rockwell never failed to pull me back into the story. Having set up the extremely tense stand-off between Mildred and the Ebbing police (Chief Willoughby calls it a war), McDonagh then explores just how violence begets violence. It is here that Three Billboards strikes a chord. While the script was written eight years ago, it mirrors much of the repressed anger and frustration in the world today. It is, therefore, immensely satisfying to see Mildred take matters into her own hands (much like it was when Michael Douglas lashed out in Falling Down). However, there is an unbearable poignancy to her actions and McDonagh never allows us to forget their consequences. While we root for Mildred and feel her pain, her anger and her regret, we cannot condone her extreme behaviour. The stakes are all too real here - for Mildred and her son (a rather underused Lucas Hedges), for Willoughby and his family, for Officer Dixon and for Ebbing as a whole. Three Billboards also questions whether, during the most unbearable and devastating of life experiences, it is ever possible to make a change. To course correct and choose a more benevolent path. The film features several acts of kindness and each one feels far more powerful than the acts of hatred. As a result, Three Billboards leaves its audience with much to ponder. There are no easy answers here and yet, amid the anger, there is an undeniable glimmer of hope. 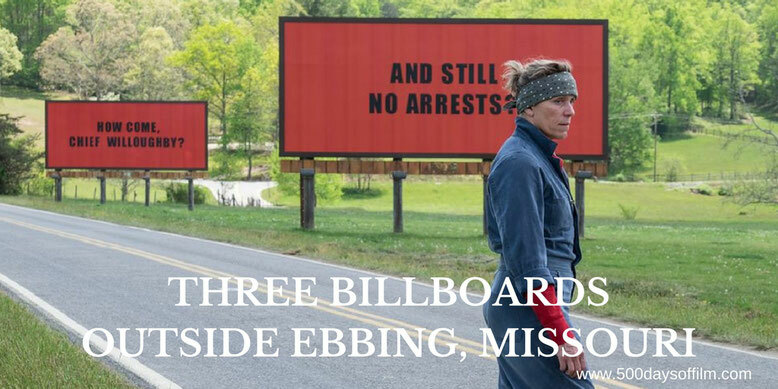 Have you seen Three Billboards outside Ebbing, Missouri? If you have, what did you think of Martin McDonagh’s film? Let me know in the box below or via Facebook or Twitter (@500DaysOfFilm).